LaValley Industries’ new TONGHAND exit-side wrench attachment provides horizontal directional drillers with a safer, more efficient way to torque up and break pipe joints, reamers, and subs. The TONGHAND hydraulic attachment’s patented rotation arms, gullwing design and integral TongVise are controlled by a single operator inside the safety and comfort of any 30-ton excavator. An in-cab display allows the operator to monitor and adjust all functions of TONGHAND operation, including the specified torque value. The TONGHAND works with pipe tool joints ranging in size from 6.5 to 10 inches. The rotation arms allow the operator to thread and unthread drill pipe connections with precision. At the same time, the gullwing design makes it easy for the operator to move the arms out of the way to make and break reamers. 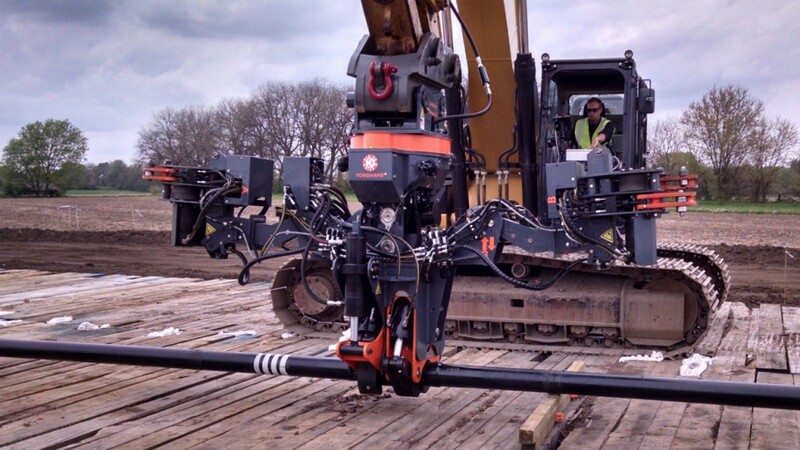 The 120,000 foot-pound torque capability on its patented vise, and the precision pipe control design, allow workers to remain safely away from drilling components while breaking joints, loading and unloading drill string components, and positioning drill rod throughout the job site. From September 29 to October 1, the product was demonstrated at the International Construction and Utility Equipment Exposition (ICUEE) in Louisville, Kentucky.